A first reaction to the idea of crowded streets is “Cars”. But there are many ways to crowd a street. 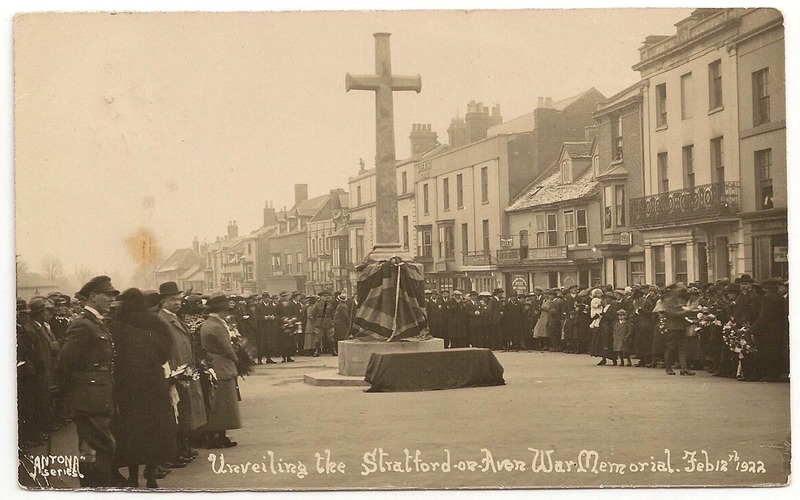 February 12, 1922 and Bridge Street in Stratfod-on-Avon in Warwickshire was crowded with foot traffic for the unveiling of the War Memorial which listed the names of the local serving men who died in World War One. Notice that the Memorial is standing in the middle of the street. After it was hit by a lorry it was shifted to a safer location. We met Mary Matilda Checkets in Framed in a Doorway in Snitterfield , By 1922 she was the widow Mrs Tansey, had moved from Snitterfield and was now living in Stratford on Avon . Her youngest daughter Ellen was also a widow. She had been married to Private Amos Unitt but he had been killed at Pozieres in 1918 and Ellen had gone to Australia and re-married. 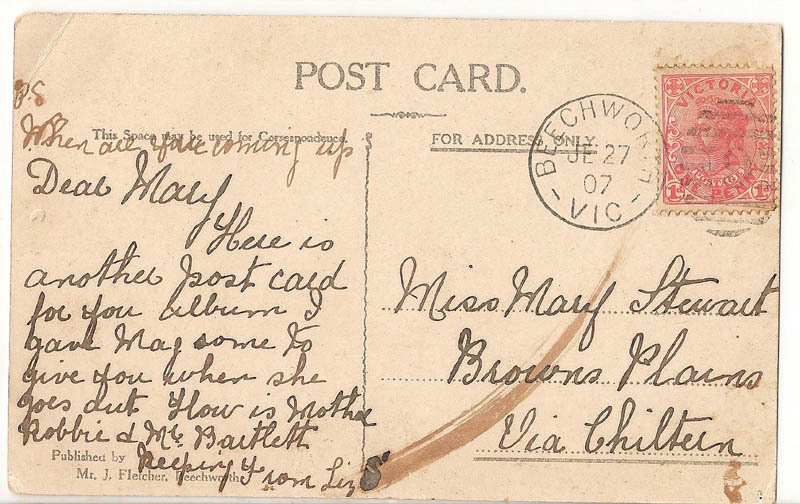 Mary Matiilda sent this postcard to her six year old grandson in Australia. His father Amos Latham Unitt had been born in Stratford on Avon and so his name was entitled to be included on the War Memorial. I think there is a little bit more to this postcard. It is stamped so has been sent to Mrs Tansey without putting it in an envelope . 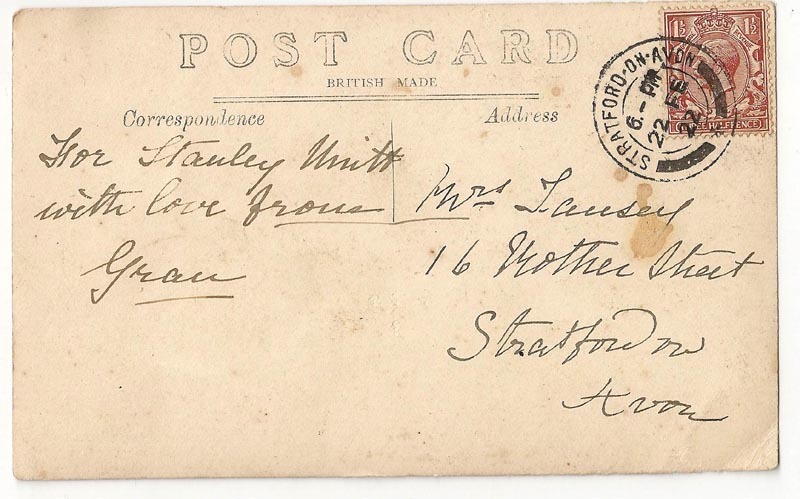 Then she has signed it as Gran and indicated that it was for her grandson Stan and it has ended up in Australia. I think the two handwritings are different so who was it sent it to Mrs Tansey in the first place ? 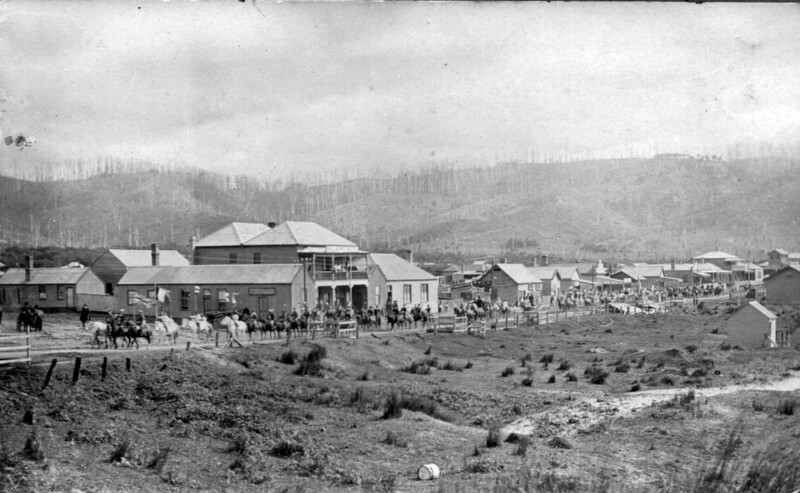 Earlier than this, in 1907 on the other side of the world, Camp St in Beechworth was crowded with four horse- drawn vehicles. Beechworth in north eastern Victoria is a remnant of the gold rush in the 1850s This postcard has a linen type texture which makes it hard to scan. Bandmaster Tom Tansey and his wife were to live in this street in the 1930s. 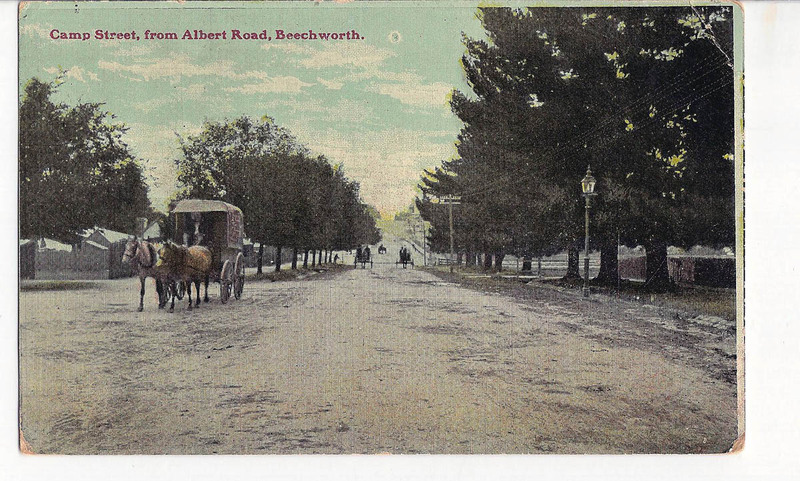 Perhaps some day I will be able to find a family member connected to the recipient of this Beechworth postcard and hand it over. A Parade is another way of crowding a street. 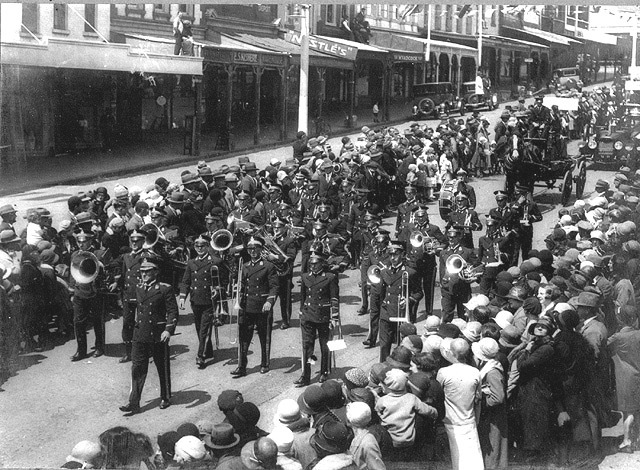 A Gala Day Parade is held each year in Geelong to raise money for the local hospital Here is the Geelong West Brass Band marching down Moorabool Street in the Gala Day Parade in 1931. The bandmaster was Eric Searle. 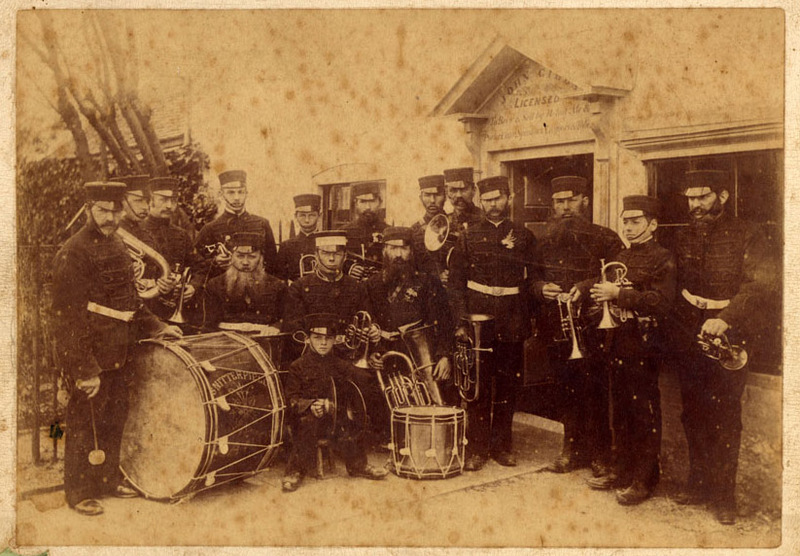 The band had been revived in 1929 after having lapsed a couple of times. 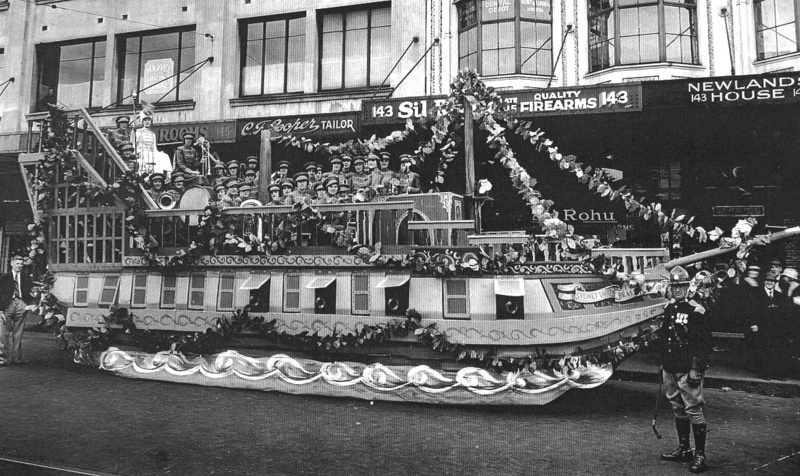 And in a Parade in Sydney c1938 the members of the Sydney Ladies Brass Band were on a highly decorated float, led by their trainer and conductor Hilda Tansey. 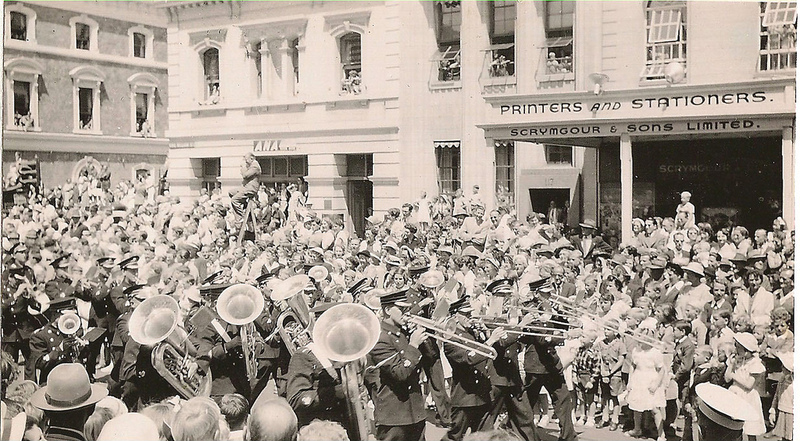 This entry was posted in Brass Bands, Family History, Genealogy, Uncategorized, War and tagged 1907, 1922, 1931, Amos Latham, Beechworth, Bridge St, Camp St, Checketts, Eric Searle, float, Gala Day, Geelong, Ladies Brass Band, Mary Stewart, Moorabool St, procession, Snitterfield, Stan, Stratford on Avon, Sydney, Tansey, Unitt, War Memorial on February 15, 2014 by lazycoffees. 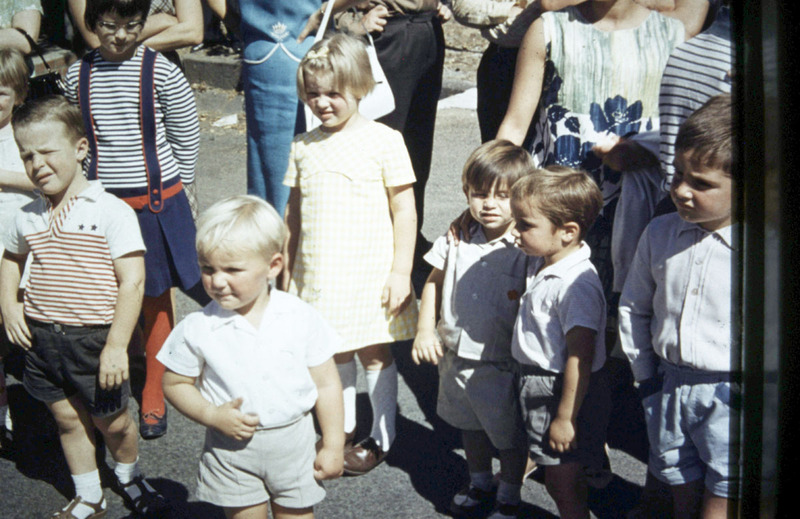 You lived in the small town of Apollo Bay on the south coast of Victoria. So what did you do when the need to celebrate arose.. 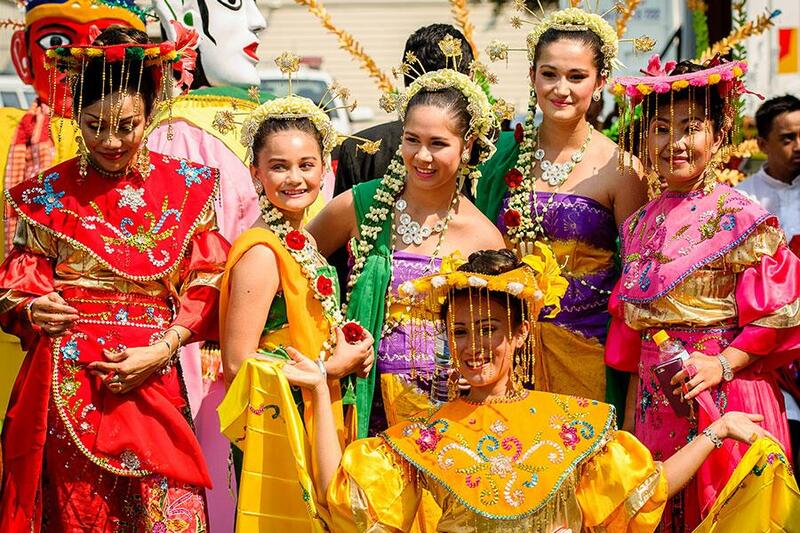 The usual thing was to hold a procession, follow it with a lunch, then some sports at the oval in the afternoon and conclude with a concert at night. 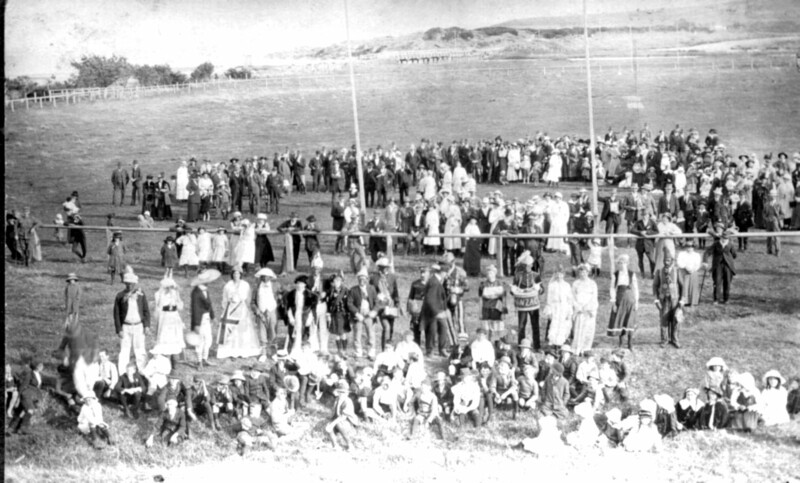 This is how Apollo Bay decided to celebrate Peace in July 1919. On June 28, 1919, Germany and the Allied Nations (including Britain, France, Italy and Russia) had signed the Treaty of Versailles, formally ending the war. 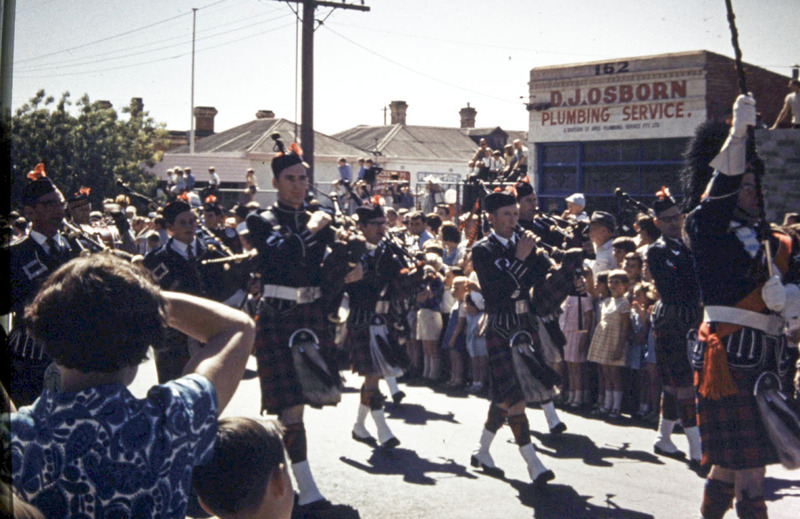 The procession started from “Milford House,” headed by the Band, in the following order:—Returned Soldiers in charge of Lieutenant W. Vipont, decorated vehicles, fancy costumes, lady riders, and riflemen Some distance away from Apollo Bay the Camperdown Chronicle later reported that bad weather spoilt the planned sports events so the children spent the afternoon playing games in the Mechanics Hall. 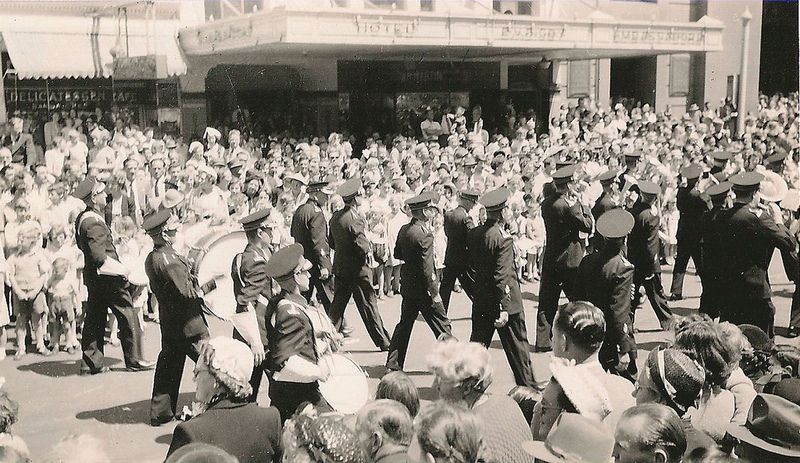 The town had organized its first ever procession two years before in April 1917 to celebrate Anzac Day. Not exactly a celebration of peace but remembering fallen soldiers and a we-are-hoping-that-one -day-there-will-be-peace celebration – in its way a rehearsal for the Peace Celebration. I think that this image is possibly for that day in 1917. They are marching towards the south, shops and houses on their right and the ocean just outside the picture on their left. It typifies the way that a small community has of celebrating – let’s get together and do what we can with what we have available to us – people, a community hall, a sports oval and some imagination. 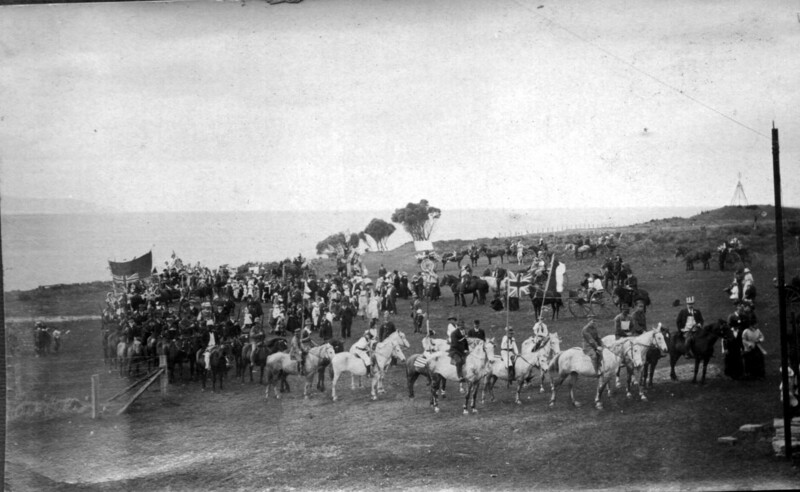 A report by the Colac Herald said the procession was led by returned servicemen followed by boys in white, all riding white ponies. Then boys representing the nation’s hope, carried flags on poles. The remains of the Rifle Club followed – married men and men over military age being nearly all that is left of the Rifle Club. Vehicles and banners and representations of the Allied nations followed. Another photo was taken when the reached the Sports Ground high on the bluff overlooking the ocean. In the following photo the people representing the various nations can be seen more clearly. Boadicea is there with her shield, girls in white looking as though they are ready to dance a maypole, Anzac written on the front of a drum, blackface used to represent some friendly countries, a Scot in a kilt. 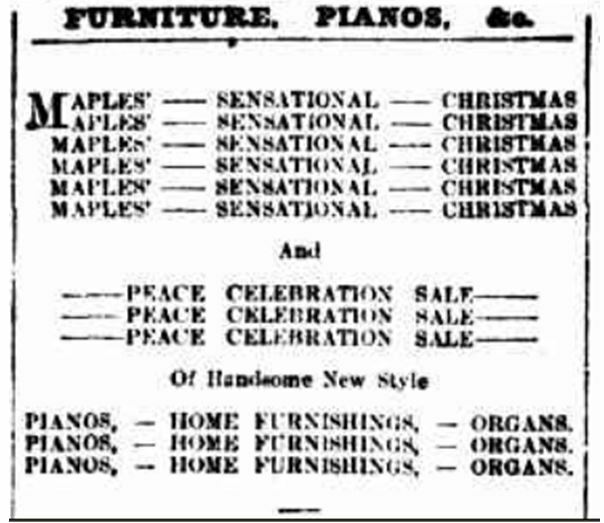 This is how the Peace Celebration was reported in the Camperdown Chronicle , 19 July 1919. And can you imagine any self-respecting store in Melbourne neglecting to try and cash in on the Peace celebrations ? Ladies and Gentlemen, spend up big – we now have Peace ! From the Melbourne Argus after the November 1918 Armiistice. For other stories centred around Peace click on the links on Sepia Saturday. This entry was posted in Apollo Bay, Genealogy, History, Uncategorized, War and tagged Apollo Bay, Armistice, celebrate, celebration, concert, pageant, peace, procession, soldiers, sports, Versailles, war on September 21, 2013 by lazycoffees. What is precious, tattered, torn and handed down? 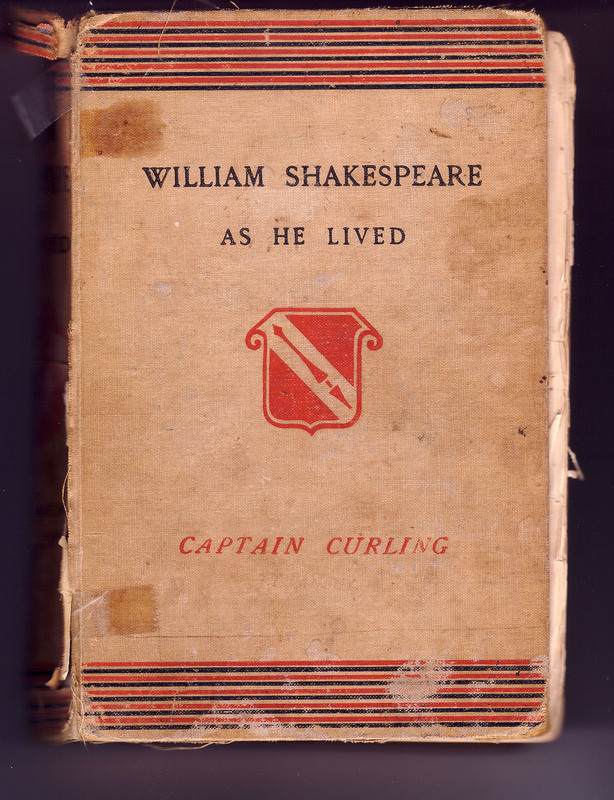 When my grandfather, Tom Tansey, landed in Geelong in 1888 as a sixteen year old he brought with him this copy of WILLIAM SHAKESPEARE AS HE LIVED by Captain Curling. Shakespeare’s grandfather had a farm at Tom’s home town of Snitterfield, just to the north of Stratford on Avon in Warwickshire. So why had Grandpa brought this particular book with him? It was a farewell gift from Ben Currier and his wife Ellen. Ben was a farmer and much older than Tom but Ben and Tom were both members of the Snitterfield Town Band and this had been a parting gift and was one that Grandpa kept all his life. In the band photo Tom is the short chap fifth from the left in the back row while Ben is standing at the right hand end of the row, This photo was taken the previous year (1887) in front of the Red Lion in Stratford on Avon when the band led the procession celebrating Queen Victoria’s Jubilee. Tom was 15 and Ben 32. I was amazed to find that the book has been re-printed as a paperback but is also downloadable fron the Gutenberg Project, Monash Uni library, etc, etc. This book was first published in 1853 but Curling was a prolific writer and the book had been published before under different titles. It is described as a Romance and is based on fact with a lot of imagination thrown in ! 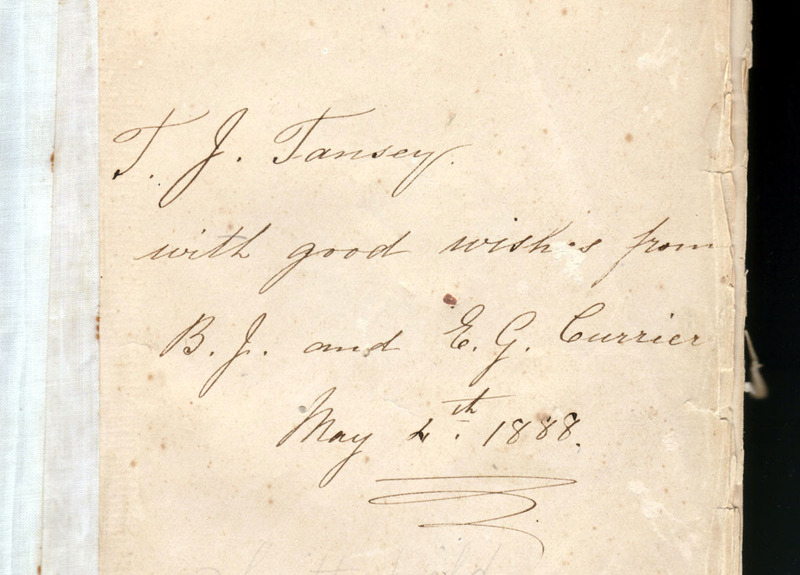 This entry was posted in Authors, Books, Brass Bands, Genealogy, History, Shakespeare, Uncategorized and tagged 1888, brass band, Captain Curling, Currier, emigration, genealogy, gift, Jubilee, procession, Queen Victoria, Shakespeare, Snitterfield, Stratford on Avon, Tansey on July 25, 2013 by lazycoffees.